Riverside Inn is the best choice for those who look for the convenient location, value for money and safe place hotel in the city. Located in the city\\\'s business and social hub, and proximate to local government institutions, its best suited for those always on the go. Riverside Inn has 24 hour security, with all the complete amenities of a standard businessman\\\'s hotel at lower cost. how far from iloilo airport,sm iloilo and from tagbak terminal? ano amenities ng 695.00 na room and what floor ito? nag text ako kahapon. I was calling your CP# but not available , ano ba ang CP# number nyo? all your telephone and cellphone numbers are not accessible. ahtas up with that? hi, is this nearby four season hotel? Can you accomodate my family for 2 nights on Aug 19 to Aug 20? I have 5 kids, the eldest is 15 and the youngest is 2 years. If we could stay in a big room and you can add the charges.Thank You! is there available room from aug 11, 2011 - aug 14, 2011 (chkout)? Hi there! just want to ask if its ok to get a single room but with 2guests. We'll just be staying overnyt. Can I ask if your single room is available on July 1- July 4? What are the amenities of the room? How far is it from the PRC office? Please text me in this number, 09298581117, I will be waiting for your text or call regarding this. I would like to inquire matrimonal room with breakfast for two for May 28 up to May 31. We will be arriving around 9 am . How much will it be?You can contact me through my email address thank you.Is your hotel near the city or what? 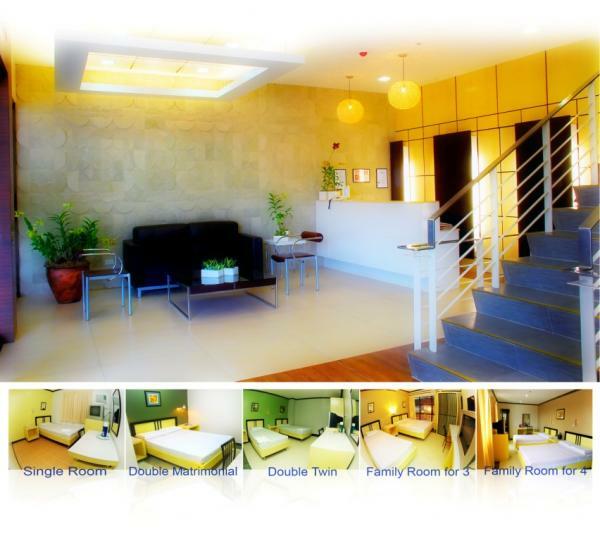 hi, just want to inquire for room availability on march 31, 2011 for 3 persons. how much is the rate? thank you very much. is ur Double Matrimonial w/ Breakfast @ Php 1,050.00, plan to be in iloilo on march 26, 2011 thanks! Hi, just wanna inquire if about your double matrix room. Is it possible if we could stay only for 3-6 hours? pls. txt me at 09385360001.
do u have any vacant room for march 12, 2011...one matrimonial room good for two with breakfast. Pls text me at this number: 09283259845. Thanks. How much is your monthly rate for a family suite for 3? What is included? we would like to make a reservation for 5 pax, if possible family room good for 4 plus 1 extra bed. this would be on april 23, 2011. how much would be the rate? thank you. hello wanna ask if still have available room? pls txt me 09494677777.
can i reserve for Jan 23 good for 2 or 3. I preferred double matrimonial with breakfast. hi! i just would like to check if you have an available single room for december 27-31? please let me know asap. thank you. can i reserve for Jan 22 - 24, 2011 room good for 3 adult and one 4 yr old child? how much? Hi, I would like to make room reservations for Nov 25. 1 day reservation double matrimonial with bfast. how much would this be. Please advise asap. thanks. is there any promotion package for December 2010? I will be assigned in Iloilo City and stay there for two to three months. Do you accept monthly rental of a single room? How much is the monthly rental? How much is the cost of your laundry and ironing of my clothes? hi..! our group is planning to be in iloilo. your place is one of our options... where looking for a place that is good yet cheap... were about 7-10 persons... what can u offer us...? Will 3 persons(2 adults & 1 child) be accommodated in the double matrimonial room? We plan to reserve one for 28-30 August 2010.
btway, here's my personal mobile no. 09291703247 give me a call for confirmation.. TY!! i would like to secure 1 room double matrimonial w/ bfast this coming August 07 till August 08 2010 for 1 night stay only.. asap!!! email me if it is available on the said date.. ty..
Do you have an single room for July 30, 2010?Can it accomodate 2 persons? hi, is your single room can accomodate 2 persons? I always have this pop-up error: "Your license have already expired on 2010-05-31." i think you should fix your booking engine. Sir, I cannot logged in in your site. It always says password error, etc. please send room qoutation and confirmation to my personal email add please. biclar_01@hotmail.com this from 9-11 Jul 2010 (2nyts and 3days only - single occupancy). Thanks! 0915-4419407.
please reserve me from jul-9/10; single room. do u have any discounts? please advise asap. thanks! hi,i used to be in this building before great staff and love the place.. can i have a direct booking for next month,it will be awesome if i can booked asap!! Ty..
what rooms are avail. for tomorrow? We are planning to visit Iloilo on August 3rd `10 and stay three nights there. We have two adults and one kid. Do you have a room (must be nonsmoking) to stay for three nights with promo? Send me the total room rate including taxes per night. Php695.00 single room. we apologize if the rates are not updated, we are currently experiencing technical problems. Kindly log on to http://riverside-inn.net for updates rates/promos and contact details. Thank you very much. ssingle room mam pwede po ba 2 persons? do you an available Double Matrimonial w/ Breakfast (2) Php 1,025.00 on June 12-14? how much is the cost all-in? Do you have function rooms? please have a reservation on may 27,2010 only for one night..
Hi. How much is the rate for family room for 4 pax we will be staying for 1 night 16.07.2010 ? can we take 4 persons for single room? 2 children and 2 adults? Hi! I would just like to know if you have a family room for 3 on April 27. Does the rate above applies on the said date? How can I make a reservation? Thank you very much. Hope to hear from you right away. confirmed sir. thank you very much, i sent u a PM. would you allow 2 persons to stay in single room? thank you..
ist possible to take a single with breakfst,but two person staying? how far is it from the airport? from sm city? May available room(s) kayo for a family of 5 on April 28 and May 2? good day! how far is the inn from the airport? can we reserve for double matrimonial and family room for 3 on Feb 7. Thank u.
hi! do you still have an available room for two on jan. 23 to 24 for dinagyang 2010? pls reply asap. thanks! family room for 4 people available for jan 24? what will the price be? Hi just want to reserve one room for Dinagyang 2010-Matrimonial (package Jan.22-24) Thanks..
is your double matrimonial is available on march 15? does your rate includes breakfast? how far is your location to the airport? available pa dinagyang family package? tnx. do you provide transfers to airport-hotel v.v.? how much? Can I reserve one single room for January 23, 2009, be there in the am to pay. Thanks. Thank you for all the inquiries. PM sent. Dinagyang rates are now available. Riverside Inn will be Wi-Fi ready by January 2010.